Large pillows 70x80 cm (equals 27×31″ inches) for sleeping dedicated for children of teens and adults. 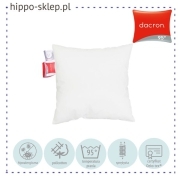 Largest firmer pillow size in Poland and some other countries called there as standard pillow. 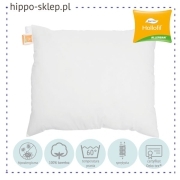 A high thicknesses sleeping pillow for side sleepers older children, teenagers and adults with size suitable for most popular pillowcases size in Poland. Here you find pillow 70/80 cm with inserts filling made of natural down or feathers as well as synthetic 70/80 pillows with filled by polyester, silicone or Fillball fibers. Anti-mite pillows 80x70 cm Hollofil Allerban, anti-allergy pillows Dacron 95 and Sensidream. 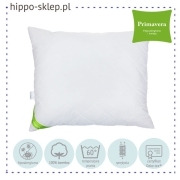 Large back pillows 70x80 Primavera or comfortable 70 × 80 Comforel Allerban pillows with cotton cover as well as 70×80 Dacron 95 pillows with high temperature resistance with possibility of washing at 95°C. In addition to the standard medium and high thicknesses pillows, here you will find pillows with the possibility of height adjustment by adjusting the amount of filling inside. Adjustable pillow can be flat, medium or high depending on our needs.